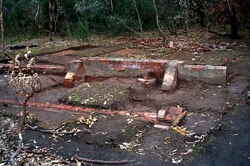 The area that the La Trobe Wildlife Sanctuary now occupies was once inhabited by Aborigines who were aligned to the Kurnaj-berring tribe of the Wurundjeri clan. No one knows how long the area has been used by humans, but it is probably at least several thousand years. Unfortunately, much of the Aboriginal history of the area was lost very early after the arrival of Europeans. 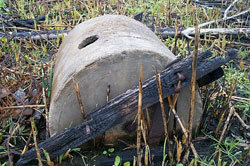 In this area, many large wetlands existed that were frequently utilised by the local Aborigines. Early Europeans in the area observed the rich nature of these wetlands, in particular the abundance of wetland birds, such as Brolgas and ducks. Even during prolonged droughts wetlands provided a plentiful supply of edible plants, eels, freshwater mussels, fish, snakes and snaked-necked tortoises. Evidence of the use by Aborigines of the area is observable in the scars on trees and fragments of stone tools. When the first Europeans arrived in the Bundoora area (formerly the Parish of Keelbundora) in 1835 they noted its 'parkland' appearance - well-spaced trees with an understory of grasses, herbs, and forbs. The area was originally surveyed in 1837 by William Wedge-Drake, an assistant to Robert Hoddle, the chief surveyor of the Port Phillip District. The main reason for the surveying of the area was to allow the sale of land. Up until this time the area was controlled by members of the Port Phillip Association (including John Batman) who grazed their sheep without regards to traditional owners - the Wurundjeri. The land was auctioned in Melbourne in 1838 and the Bundoora area was divided into two sections of approximately 400 hectares. Most of the land was bought by land speculators and the wealthy and within a few months was resold as much smaller farms of 100 to 300 acres. The farms were mostly used for sheep grazing and grain production. The wheat produced in the area was considered of high quality. Within the La Trobe Wildlife Sanctuary, you can observe fence posts which date from the time of settlement. These were cut from local timber, either Red Gum or Yellow Box. In 1910 the Inspector General for the Insane commenced the construction of farm cottages, including a 500,000 gallon (2,275,000 litres) water tank on Mount Sugar Loaf (now called Gresswell Hill). This was to become an extensive area set aside for the treatment of psychiatric patients. The hospitals were self-sufficient in food with extensive areas of gardens for the production of every conceivable type of food including pork, milk, grains, vegetables and fruit. During this period two major wars occurred in which Australians participated. The hospitals were heavily used by the military for returned soldiers suffering from psychiatric and other illnesses. Also during this period, various recreational facilities were constructed, including an oval and tennis courts. Many species of exotic plants were planted and some can still be seen around the Wildlife Sanctuary and adjoining Crown Land Nature Conservation Reserves. While some were planted for agriculture purposes most were planted for ornamental reasons. On 26th October 1965, 530 hectares was excised from the Mental Hospital Reserve. This corresponded with the closure of the Hospital farm in 1965. The original sanctuary was only 6.5 hectares and has been added to over a number of years to now total 28.8 hectares (not including Crown owned Nature Conservation Reserves). 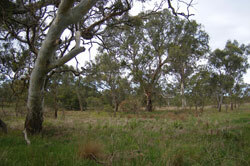 Gresswell Forest Nature Conservation Reserve (NCR) came under the management control of La Trobe University in 1978. The Gresswell Habitat Link is the most recent addition to the sanctuary project, with management control being passed from Department of Natural Resources and Environment in 1996. The Habitat Link was established to provide a link between Gresswell Forest and the La Trobe Wildlife Sanctuary. Since the 1970s, the La Trobe Wildlife Sanctuary has created a network of wetlands that assist in maintaining water quality and health of the surrounding ecosystem. Today, these wetlands provide essential habitat to a range of species, including the threatened fish Eastern Dwarf Galaxias (Galaxiella pusilla). Since the establishment of the La Trobe Wildlife Sanctuary there has been an extensive program of exotic plant eradication and re-establishment indigenous plant species. The major management issues faced by the Sanctuary include invasion by exotic plants and introduced animals (such as foxes, cats, starlings and Indian Mynahs). In 2015, a great milestone was achieved with the erection of a 2.2km predator-proof fence that now encompasses the Sanctuary and protects its inhabitants. This fence has been specifically designed to stop introduced animals from surrounding areas entering the Sanctuary and will allow for the future introduction of indigenous, endangered and threatened species. The Wildlife Sanctuary, alongside La Trobe University, turned 50 in 2017. As we look towards the next 50 years, the future is certainly bright. The predator-proof fence will provide an extraordinary amount of value in its ability to facilitate many initiatives and projects, including the potential re-introductions of small mammals which would have once occurred in the area. We are especially excited to enhance our offering to La Trobe University students and the array of courses that can benefit from the Wildlife Sanctuary having increased biodiversity and conservation potential. We truly are La Trobe University's Outdoor Laboratory.